This auction is for a 2015 Chevrolet Corvette Z06 coupe with the Z07 package. It will be a 2LZ car. It will be white with red interior, black wheels, red calipers, navigation and Performance data recorder. It will be a 7 speed manual. It will have the carbon fiber ground effects too. The first cars being built are going to be coupes with the 7 speed manual transmission. The automatic and the convertible will come a couple of months later. Not up for debate. Porsha all day. With MT available, the temptation is great. GT3. Not even a hard decision. One will be worth 200k in 5 years, one will be worth 40k. That being said, even if I was sitting on the one worth 200k I wouldn't be able to sell it. All times are GMT. The time now is 06:21:51 PM. 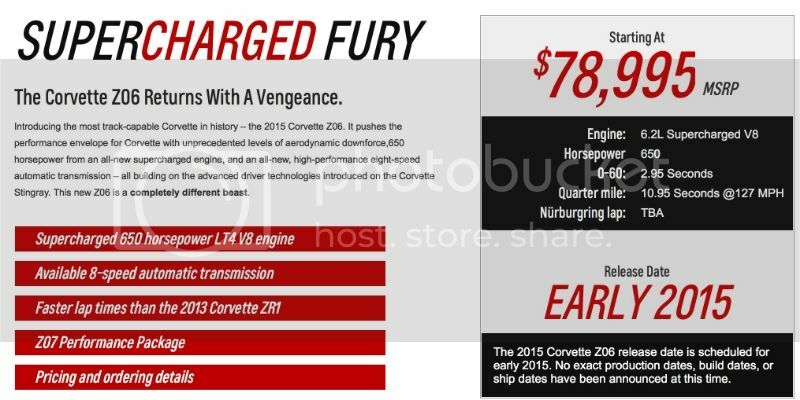 Discussing $100K question: 2015 Z06 or 2010 997.2 GT3 in the Off Topic Forum - Place to discuss this and that. Note: We also have "request to join" forums: Guns and Fitness.